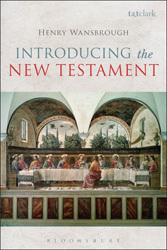 Introducing the New Testament presents the complex and often challenging texts and history of the New Testament in a clear and informative manner. The book begins with a section that gives readers a clear idea of how to use it most effectively for study and personal research, followed by a chapter which outlines the various manuscript traditions and processes of transmission that resulted in the biblical texts we have before us today. With this groundwork complete, readers are then introduced to all the texts of the New Testament, and to major issues and debates such as the 'Historical Jesus' the 'Synoptic Problem' and current debates surrounding inspiration - how these texts can be seen in both a historical context and in the context of religious faith. The book features maps, chapter summaries, sample essay questions, chapter bibliographies and reading lists, and an annotated glossary of key terms. Fr Wansbrough covers the entire New Testament from historical and theological perspectives, but also retains a focus on inspiration/meaning, making this both a textbook and an excellent resource for personal research into faith. The book can be bought from the Bloomsbury website: http://www.bloomsbury.com/uk/introducing-the-new-testament-9780567656681/ at the paperback price of £17.09, and is also available in hardback and e-editions.